At Recode's Code Conference today, Amazon CEO Jeff Bezos was asked why the online retailer does not sell either the Apple TV or Google Chromecast. Bezos reiterated that Amazon chooses not to sell video streaming devices that do not include Prime Video capability and that the company wants "acceptable business terms" before bringing the the app to devices. We sell Roku, we sell Xbox, we sell PlayStation. We're happy to sell competitive products on Amazon and we do it all day. We sell Nest thermostats. When we sell those devices, we want our Prime Video player to be on the device and we want it to be on the device with acceptable business terms. We can always get the player on the device, the question is whether you can get it on with acceptable business terms. And if you can't, we don't want to sell it to our customers because they're going to be buying it thinking you can watch Prime Video and then they're going to be disappointed and then they're going to return it. When pressed by The Verge's Nilay Patel on whether "acceptable business terms" meant paying Apple's 30 percent cut on in-app purchases and subscriptions, Bezos declined to answer, only stating that he wanted to keep private business discussions private. Amazon ceased selling the Apple TV and Google Chromecast last October, saying that it was important for Prime Video to interact with streaming devices it sells to avoid customer confusion. In November, Amazon confirmed to engineer Dan Bostonweeks that a Prime Video app was in development, with the company saying that it hoped to launch the app by the end of 2015. 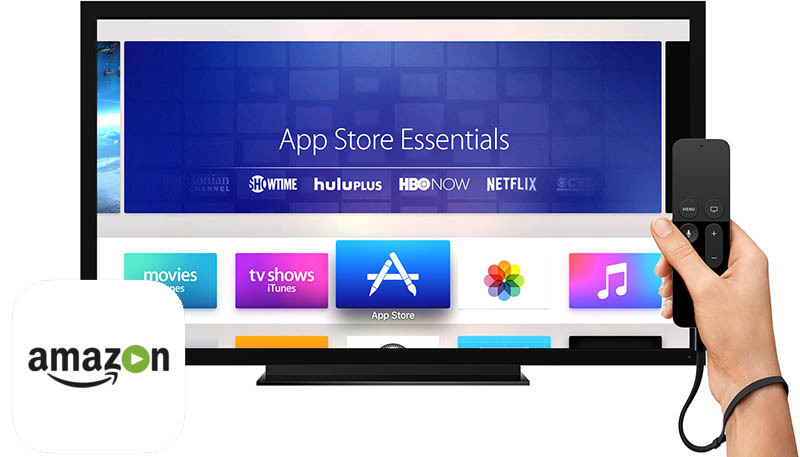 While the app didn't launch for Apple TV, Amazon did debut a standalone Prime Video streaming service for $8.99 a month, allowing users to subscribe to the service without signing up for the annual $99 Amazon Prime bundle, which includes free shipping from the company's retail store, unlimited streaming music and more. Amazon Prime Video for iOS is available in the App Store for free and accessible by Amazon Prime members. The service is also available on Android, Fire OS, Amazon Fire TV, PlayStation 3, PlayStation 4, Xbox 360, Xbox One, Wii, Wii U, the web and select TVs and Blu-ray players from LG, Panasonic, Samsung, Sony and Vizio. What "acceptable business terms" do they currently get on iOS (where the app is available now) that are not currently available to them on tvOS? Engineer 1: Bro, I dare you to develop a version of Prime Video that's compatible with the Nest. Engineer 2: Hahaha, screw you, dude. Engineer 1: I triple dog dare you. I always stream Amazon prime video from the iOS app to my Apple TV. One of the reasons I have the old Apple TV. You know you can still AirPlay with the 4th gen AppleTV, right? I bought the new Roku Streaming Stick primarily for a Prime app -- the UI is so klunky that I prefer AirPlay casting from my iPhone. Amazon seems to hire the absolute worst UI designers in the industry. They seem to take pleasure in producing interfaces that unnecessarily frustrate their users. Can't really understand how customers could expect that every piece of tech they buy from Amazon includes the Prime app, and then get disappointed and return it if not. Amazon ceased selling ('https://www.macrumors.com/2015/10/01/amazon-to-stop-selling-apple-tv-chromecast/') the Apple TV and Google Chromecast last October, saying that it was important for Prime Video to interact with streaming devices it sells to avoid customer confusion. Trust me, Jeff. We're not confused. We just want Prime on AppleTV. I have Prime for the shipping, but I would never pay for it for streaming unless it were on Apple TV. People actually use the Prime video? I wish I could just subscribe to the Prime shipping and pay less. Dumping the video service and other junk services. The only reason I have Prime is for 2-day shipping. All the media that is included is a bunch of junk movies and TV shows I could care less about. Every once in a while I look to see if there is anything. All the good stuff you have to purchase. As for purchasing why would I pay as much and often more for their low bitrate HD content rather than buying a much higher quality BluRay? There are some really good shows on Amazon Prime, Man in the high castle for example among others. I always get the feeling that Amazon vastly over-estimates how much customers value their video/music/fire services and devices. Comcast or Netflix might be high-value enough to make changes happen, but not Amazon right now.